Our corner of New England is rich in history. Over 300 years ago, woodworkers in the Connecticut River Valley were making remarkable pieces of furniture. An extraordinary example of early American Furniture, from our area, was recently re-discovered in California. It has a fascinating connection with this region and specifically Longmeadow. Have you ever heard of a Hadley Chest? Young women, who were about to be married, often received wedding gifts for their new homes. The girls in the Hadley-Hatfield area used these storage pieces for their dowery items like blankets, linens, sheets and personal items to keep items safe and dry. 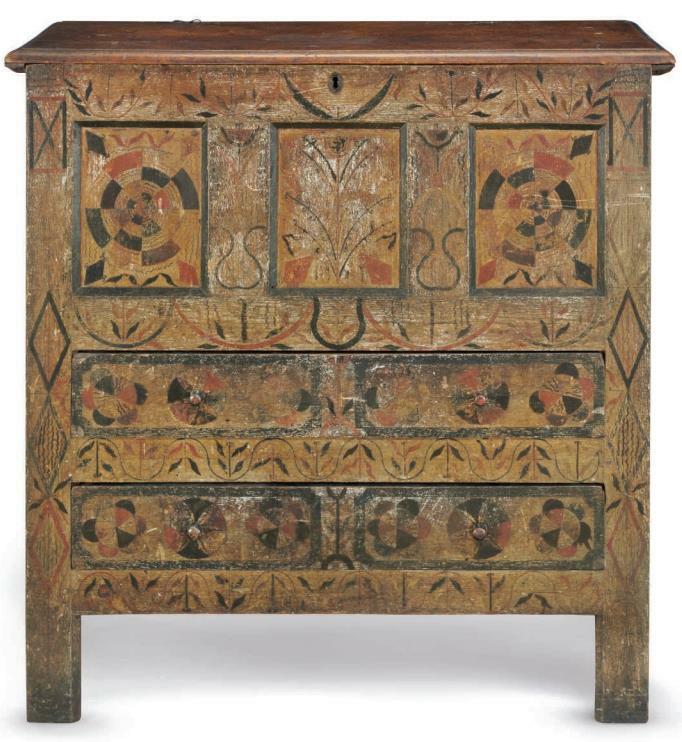 This 1-3 drawer form, similar to a blanket chest, consisted of a hinged top and was often carved with floral designs, vines and geometric patterns. Hundreds of these chests were made, and a select few have survived in museums and private art collections. Experts in the field of American furniture think that over 500 Hadley type pieces were made between 1680-1740. Specialists believe this example dates from circa 1715. The Hadley chest with a Longmeadow connection is the best of the best! We do not know who this chest was made for. These case pieces were custom made for the elite families and considered luxury goods. Some of the Hadley chests have carved initials on the front surface stating who the chest was made for. Rhoda Belding, Hepzibah Dickinson, Katron King, Sarah Williams, Martha Williams, Esther Williams, Hannah Barnard, Mary Pease, Joanna Porter and Sarah Hawkes are just some of the names that their Hadley chests have immortalized. Similar chests are in the Henry Ford Greenfield Museum in Dearborn, Michigan, the Henry Francis DuPont Winterthur Museum in Delaware and in the Memorial Hall , (Pocumtuck Valley Memorial Association) Deerfield, Massachusetts. The Porter-Phelps-Huntington Museum in Hadley has a similar “compass” painted chest in their historic house museum. This is worth a trip! The Museum of Fine Arts in Boston, The Historic Northampton Museum, The Wadsworth Athenaeum and several other institutions also have special Hadley-type chests in their collections. None are as unique and rare as the one from the Brewer family from Springfield-Longmeadow. The character of the colorful paint designs and quality of the condition make it the best of its type! 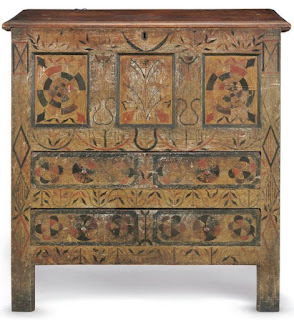 The upcoming sale of this chest is a hot topic in Manhattan art circles. Every year, Americana Week is held in late January during the time of the Winter Antiques Show at the Armory on Park Avenue. Christie’s auction house, located in Rockefeller Center in midtown, will be offering the Hadley Chest in their January 22nd sale. The estimate is vague with the text in the catalog stating, “ estimate upon request”. The last Hadley chest sold at Christie’s in 2011 fetched more than $400,000. I have heard, off the record, that this particular chest may go for more than $500,000 and perhaps much more. I recently discovered the existence of this chest from the Facebook page entitled “Historic Springfield & Pioneer Valley”, which I follow to find out news of local historical events. It would be wonderful if the Hadley Chest came back east. A private collector from Western Massachusetts, or a local museum, would be an appropriate spot for a piece of 18th Century furniture of such importance. It will be a very exciting auction to watch. Bidding could be fierce if two or more individuals are intent on winning the competition. Will someone from our local area have the means and the foresight to bring our heritage home? Could a successful bidder donate it to a museum in the Connecticut River Valley? I certainly hope so. One hundred years is a long time to be away from home! This Hadley Chest was auctioned off at Christie's for $850,000 on January 22, 2016. The starting bid for this 300 year piece of colonial furniture was $320,000. With the buyer's premium included the auction sale price was $1,025,000! The buyer was not identified. Here is a link to a post on the Longmeadow Historical Society Facebook page with additional information.